Schooley Caldwell completed a comprehensive Master Plan for the nine buildings that make up Franklin County’s Government Center in downtown Columbus. Schooley Caldwell, along with a court consultant, gathered building and site data, conducted interviews with representatives from county agencies and other stakeholders, and did a physical assessment of each existing building. 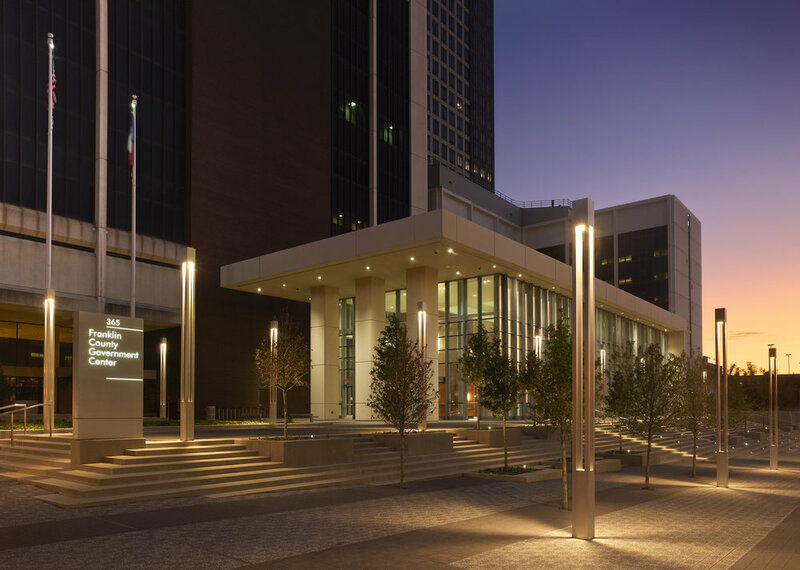 With this data, the space needs and programmatic requirements for the new courthouse and the existing facilities were updated. A phased plan to update, expand and improve operations was developed. Key components of the master plan include improved signage and wayfinding to assist residents in making their way around the campus as they conduct county business, improved accessibility, and the connectivity of existing campus buildings with the new courthouse. Designed to be dynamic, flexible, and adaptable to meet changed in future county operations, this master plan will help guide the county’s downtown campus facility usage over the next 25-50 years. Schooley Caldwell subsequently designed the new entry pavilion at the Hall of Justice building, which ties together the existing complex with the new courthouse building which was completed in 2010.